I did not grow up in a quilting family, however, my mom did sew. Both my sis and I learned to sew on my mom's Singer Touch 'n Sew when we were young - not super young like many people, but by the time we were young teenagers we were sewing. I learned to crochet somewhere around the age of 11 or 12 - and we were sewing by 13. But I didn't know anyone personally who quilted - until I got married. I saw quilting fabric in stores as when I was an older teenager, home decorator sewing was beginning to be very popular and fashion sewing was on the wane - in the late 1970's and early 1980's. Oh yes...maybe I should mention that I majored in Home Economics Education. Sewing was my strong point - stronger than cooking or decorating or home design. In our early marriage, one time when we were visiting Mike's (my husband) mom in Albany, OR, his sister, Cathy, was there and she was working on a quilt. I saw one in person that day! She did beautiful work (still does) and I remember even now that it was an Amish quilt! I was amazed--it was so pretty! We flew to our mission board's headquarters in Tempe, AZ, and we stayed with a lady (this would have been in about 1992) - and I remember the lady had a biscuit quilt on her bed. She said she made it! I loved it and was interested - I thought it was very cool! I don't remember her name, sadly - but I do remember her quilt! We used this quilt on our bed for years. It is heavy and warm! This crazy quilt was made by ladies at Community Baptist Church in Croswell, MI. We were on deputation (in the early 1990's) to come to Poland - that means that we were in various churches, presenting our ministry and trying to raise support. One of the churches we were in gave us a crazy quilt. I was so amazed - I thought it was the most beautiful thing in the world! I think I almost cried, I was so happy! I asked one of the ladies how they made them - as I knew they made many of them and gave them to various missionaries and special speakers who came through their church. (This church is in Croswell, Michigan). She explained it to me. I just nodded - and thought I more or less understood how they did it. Then we came to Poland. I got busy with my life, however, and then we had 2 more kids. I had a small, Pfaff hobby style sewing machine (very good machine even now and it was purchased at an electronics/home goods "big box store"- like Staples or Circuit City used to be), and made clothing items and a few household things, but still didn't seriously think about quilting. Life held other demands. I treasured it. I used it. I thought it was so sweet! (I am still amazed.) Back then I had no idea what it took to put a quilt like this together. When I realized that these words and the flowers were fading on this quilt, I quit using it - as I didn't want to wash it anymore. Each time I washed it, the words faded. You can see how the flowers were fading as well. I still didn't quilt or even consider it. Life was pretty hectic for me. Learning a language, living in a different culture, having 5 kids, trying to keep up with their schooling needs - both in Polish school and home schooling. It was pretty crazy in fact! In fact, I didn't do much of anything creative in those days except for some counted cross stitch. Those were tough days. Not the "good old days" - not to me. I remember asking a supporting church if they would be willing to make my sons quilts for their bedrooms - and they did! They were pretty basic - but they fit the need we had at the time - I had wanted blue and "something boy friendly". They did that with large pieces of fabric - I put them in their rooms and I was quite happy. I still didn't consider making my own quilts. Not even for a second. Then we went back to the states - it was the year my oldest son turned 15, so that must have been 2003 - and I saw a quilt on my husband's dad's guest bed. He lived in Alaska and the house was a bit...ummm...rustic. I eventually made 3 or 4 like this - a couple with red ties and red flannel as backing. This one has regular cotton as the backing. The quilt at my FIL's house was a denim quilt with plain squares on one side and a red flannel on the other with red yarn ties. I fell in love. That was it. I wanted to make one of those when I went back to Poland. (Skipping ahead in the story....When we went back to Poland, I started looking for denim. Fabric stores specialized in really nice dressy fabrics - not denim and cottons. I realized at that point that my best source of the fabrics I wanted (denim and plaids) were second hand stores and clothing items. Then I asked our supporting churches for any unfinished "stuff" they had that was causing them guilt with regards to crafts and sewing - UFOs (I didn't know that is what they were called though - unfinished objects - to anyone who doesn't know that acronym). I got inundated with goodies - most of these things I took apart and I used the pieces to pass along to ladies who lived farther east - Belarus, Ukraine, Latvia, Lithuania, etc. There were a lot of cross stitch projects, some kits, yarn, etc. Some of the fabric I could easily find homes for - or use myself. But some of it was really quite ugly, as I remember it. I remember thinking that no one that I knew in Poland or farther east had those tastes. I didn't know what to do with it, so I went on line and searched for what to do with ugly fabric. I even typed that into the "search engine." 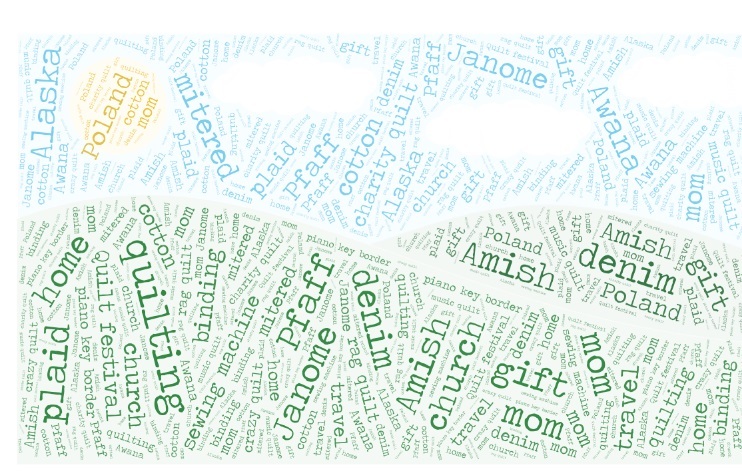 I found quilting sites - places I didn't even know existed on the web. I even found an ugly quilt contest. I had to laugh at those - as some of them were truly hideous -others weren't ugly at all. I started cutting up that fabric and began to make charity quilts out of it. I easily gave away all of those quilts - to people here in Poland. While this wasn't the exact same model as my first Pfaff sewing machine here in Poland, it was similar. In many ways I was a slow starter - at least with regards to quilting. I always kind of smile at people who say, "I'm going to become a quilter." My start was a lot more gradual than that. I was making little napkins and other decorator items, trying to make my home a little more "homey" before I attempted a quilt. I don't remember taking a picture of that quilt made from those ugly fabrics - but I remember the fabric that started it all was a sort of fluorescent purple/camo - ish color - and the shades were unlike anything I had seen before here. But I made 9 patches out of it, combining it with more calm fabrics and it made a quite acceptable quilt. To this day, the basic 9 patch block is probably my favorite block to make! And that was what I think of as the official beginning of my quilting journey. I had already been on it, simply by being given quilts and being exposed to them - I just didn't realize it yet. I didn't have to learn how to sew as I already knew how. In fact, while studying for my MEd in Elementary Education I was a grad assistant teaching sewing Beginning Clothing and Clothing Construction - in college - so sewing wasn't an issue. However, I didn't know anything about the specifics of quilting. My bindings were funny - really hilarious at first. I used to just sew them off at every corner - folding under the purchased bias quilting binding tape (I asked Rachael to buy some for me!). I had no idea how to do a mitered corner - and was scared to even try at first. It's actually not all that easy with that wide bias quilt binding they sell in packages - much easier with a more narrow fabric! After I made those denim quilts, I went on a rag quilt binge and bought flannel pjs for a year - literally - when the stores around here had them on sale for about $1 an item - and collected everything flannel I could find in colors or designs I liked. At the end of a year, I cut them all up into squares and then sorted by colors. I think I made 7 of them. I was so sick of cutting rag quilts I never wanted to make another one again! I actually did make a couple more. However my tendency to "overdo it" killed my desire to make one, though part of me could be interested again. I was also making charity quilts in the meantime - mostly just squares - cut up and sewn together - either big, like 10" or small, 4.5" or 5" usually alternating with a plain block. In 2006 we went back to the states for another furlough and we stayed in a home in GA where the lady of the house quilted. Her name was Lisa. She had amazing quilts in her beautiful house - she also went yearly to the International Quilt Show in Houston, TX. In 2008 I made my children's choir teacher a music themed quilt. I made this piano key border and in general really liked how this one turned out! Especially when I consider where I was on my journey at this point. Later when I heard the term "piano key" border I thought that this was it When I found out what a piano key border really is, I felt a little bit like Amelia Bedelia - except that she never seems to realize her mistakes! I was trying to make everything with my little Pfaff. 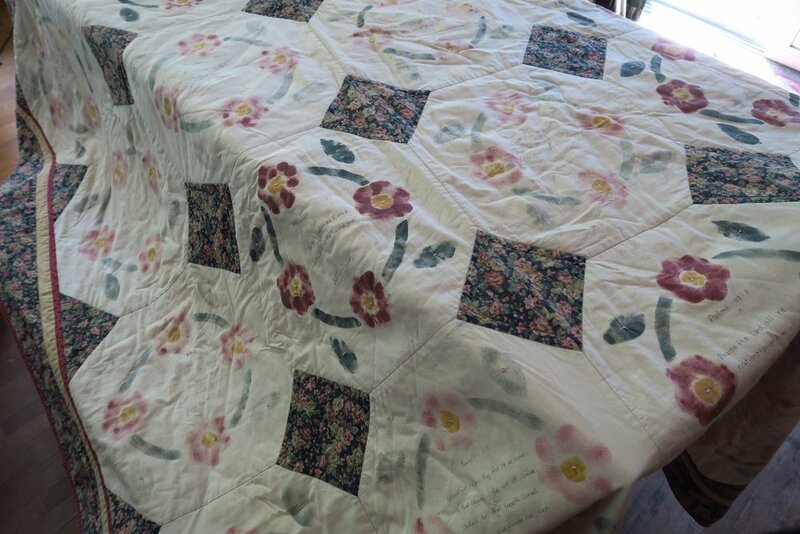 I wanted to make bigger quilts, but the Pfaff's throat was small - and shoving even a twin size through that throat was hard work - combined with the fact that it is a very lightweight machine and just scooted all over the top of whatever counter top it was on. In 2010 I realized that I needed a larger machine - a machine of a different kind. I searched around for what I could get here in Poland that was reasonably priced (reasonable to me, that is). I found the Janome Horizon 7700 and bought one. I had saved up for a couple of years to be able get a really heavy duty big machine. And that is when my quilting life changed completely. Now it was fun to sew. My machine was a "heavy duty" one -didn't scoot all over AND I had lots of space in the throat! I now attempted free motion quilting! I then decided I needed to find some people who knew more about quilting than I did - as I didn't know anyone personally who made quilts here in Poland. I found an on line forum - quilting board - and then later I found Facebook groups. The people I found in these groups have helped me learn a lot. I have also spent a lot of time reading and studying the few books I have on quilting. Now of course, there are resources on line at every juncture. All of these things worked together to bring me to where I am now in my quilting journey! I hope I can help others through the information I share here as a way to give back to the quilting community as they have helped me get where I am as a quilter. And now you know...this is how I came to become a quilter! Don't forget to check out what my sis has to offer you in the store!